--Sir George Mallory, also known as Mr. Mount Everest (quoted in 1922). ﻿Before I talk about my training for the week, I want to shine the spotlight on my good friend, Ted Friedman, from Cleveland. 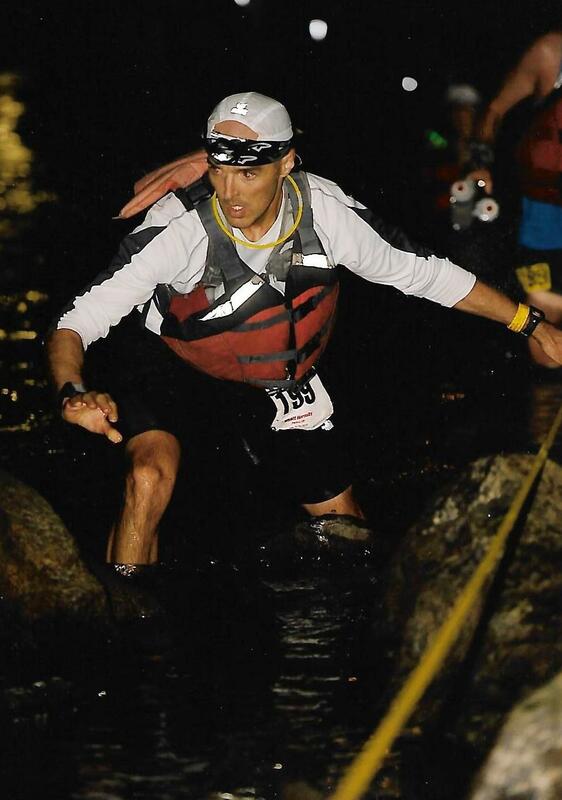 Ted is running in his second 100-miler (Burning River) this coming weekend and he's once again raising lots of money for The Gathering Place, a cancer support community. 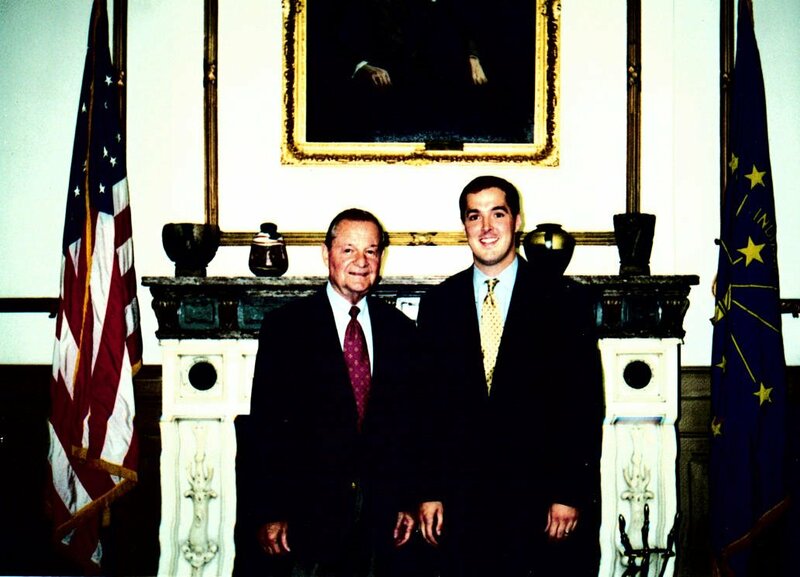 Ted lost his dad to cancer 11 years ago and, like many, believes deeply in the good work of The Gathering Place, a non-profit organization that is dedicated to helping people touched by cancer. Last year, Ted raised $10,000 for The Gathering Place through his 100 Miles for Life initiative. Most of us have in some way been touched by cancer. My sister-in-law is a cancer survivor and we lost my grandfather to melanoma many years ago. You can support The Gathering Place through Ted's run by going to his website. Also, click here to read a great interview Ted did with the Cleveland Plain Dealer. Ted and Tami, if you're reading this, put Anne and me down for a donation! L-R: Ted, me and Kenny at the 2008 Mohican 100. On Saturday morning I got up and, for some reason, dreaded the thought of driving 45 minutes to run trails in the "smaller" mountains. I wanted to run, but I really wanted to spend time with my family on Saturday, not a combined 5 hours in the car and on the trail. So, I gave myself a "break" and ran 20 miles in the Parker hills. Let me tell you; it was not an easy run. For one thing, the Parker hills are just that--hilly. It was also a bit on the warm side. I was feeling the heat in the last 5 miles. Total climb for this run was 1,200 feet and it was all between 6,100-6,400 feet. On Sunday, I woke up "recharged" and headed to Apex Open Space in Golden for 17 miles. After a little bit of a wild goose chase with my GPS, I found Heritage Square shopping center, where I parked and then proceeded up the rather rocky Apex Trail. This was my first time at Apex Open Space, so it was all new to me. I really liked the Enchanted Forest Trail and the Sluicebox loop. When I got to the top of the Apex Trail, I ran a few relaxing miles on Lookout Mountain and checked out the Buffalo Bill grave. Then I headed back down. Total climb for this run was 2,600 feet and topped out at about 7,600 feet. Right now I'm a little tired, which is what you'd expect at this stage of a 100-mile training program. The good news is that I'm not "too" tired. Overall, my energy is pretty good--otherwise I wouldn't have been able to do runs of 20 and 17 miles, respectively, over the weekend. My nutritional plan for the Leadville 100 is pretty much finalized. My primary fuel is going to be Hammer Perpetuem. I'm going for a few "test" runs to work out the kinks with Perpeturm and make double sure it's going to work for me. If I experience any issues at Leadville with Perpetuem, I'll have Gatorade on hand. Gatorade, while not the first choice for many serious endurance athletes, just tastes really good to me. I'll also have Hammer gels and Endurolytes on hand. Soup will be a major source of fuel and electrolytes late in the race. Of course, I'm going to try to eat "real" food as much as I can, but that's not always easy at 10,000+ feet. My plan this week is to get to 12-14 hours of training. This will include about 75 miles of running along with some cycling and maybe, if time permits, swimming. I think it's a good idea to start the process of allowing my legs to heal and strengthen from all this training. A slight reduction in mileage together with some cross-training may just deliver what I need. So, call it a taper if you will. My "real" taper begins in earnest next week. 220 lbs. when this photo was taken in 2002. The year was 1999 and Anne and I lived in Raleigh, North Carolina. I was fresh out of graduate school and working as a branch manager for a document-delivery company in Research Triangle Park--a truly God-awful gig. I remember the day in question. I saw my doctor for a routine physical exam. She checked my blood pressure, pulled some blood, had me stand on the scale and asked me a bunch of questions. I was about 215-220 pounds back then. When the time came for the doctor to tell me about my blood results, little did I realize what I was about to hear. "Your iron is a bit high--we need to get that down. It's probably from too much red meat. I'd also like to see you lose some weight to get your back in better shape and reduce the discomfort you're living with. Since you mentioned your concern about your weight, here's some information on healthy eating and ways you can help prevent diabetes, heart disease, back pain and other conditions." Here I am with some of our friends back in Indiana. 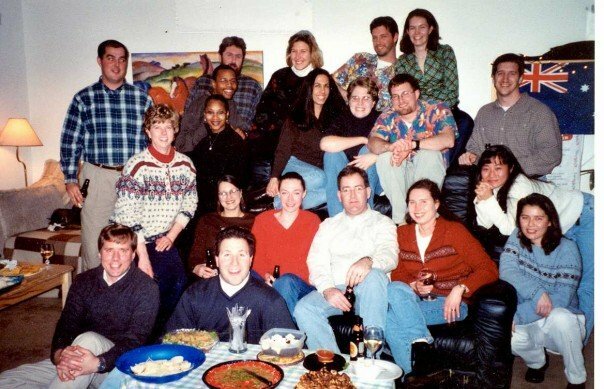 Can you find me in this photo? I'm the guy in the back row on the far left, holding the beer bottle. I was easily 220 lbs. then. ﻿﻿﻿﻿﻿﻿Well, that's the Reader's Digest version of what she told me. Like many Americans, I did nothing to heed my doctor's advice. Fast forward about 4 years to 2003. By then Anne and I lived in Lafayette, Indiana, where she was working toward her small animal medicine residency at Purdue University and I was in politics (another God-awful gig). To put it mildly, we were making a modest living at the time. One night after dinner with some friends Anne suffered a terrible migraine headache that landed us in the ER of our local hospital in the wee hours of the night. When we entered the ER, she was incoherent. The doctor scanned her head to confirm the diagnosis and put her on an IV, which helped her feel better. I had to make a bunch of decisions on her behalf. She was referred to a neurologist for follow-up care. Though we were insured, the medical bills mounted. We paid all of the bills and sacrificed in the process. That seems like a lifetime ago. 50+ pounds lighter and a heck of a lot happier. I had just won a 100-miler. ﻿﻿﻿A few months later, Anne was at home--she was off-clinics at the time--and watching an episode of "The Oprah Winfrey Show." I wasn't there, but the show centered around healthy eating and weight-loss. Oprah had a guest who espoused whole grains and warned of simple sugars. By this time we had made some tweaks to our diet to remove some migraine trigger foods, such as chocolate. But our cupboards and fridge were still full of fattening, sugar-laced foods--some of the very foods Oprah and her guests were warning us not to eat. Things like white rice, white potatoes, white pasta, white bread, sweet tea, and other sugary concoctions. Our freezer was lined with ground beef, pork chops, etc. All of it and more made up the Hornsby kitchen. When I got home from work that night, Anne dropped the hammer on me. At the time I was easily north of 220 pounds and loving the KFC all-you-can-eat buffet. I was frustrated, too. By that time I was unhappy with my weight and had started running again. I could pretty easily run 4-5 miles and jogged a few times a week, but the weight was still there. Though still quite thin, Anne wasn't happy at all with her weight and was still thinking about her migraine attack. Changes had to be made, she demanded. No more simple sugars! We're going to eat brown rice, whole wheat pasta and whole grain bread. No more brownies and cookies. No more sweet tea! No more weekly pizza binges! (Note: Pizza is STILL our weak spot.) And the red meat needs moderation! And so began a new life for us. For me, that was 53 pounds and 31 marathons and ultramarathons ago. For Anne, I'm not sure how many pounds ago it was, but today she looks better than ever. Vastly improved health, along with a little inspiration from a friend, Steve, and my father-in-law, Doug, an accomplished marathon walker, allowed me to achieve a dream I'd long had. In October of 2004, I traveled to Columbus, Ohio with Doug and finished the Columbus Marathon in 3:22. I'd wanted to run a marathon since I was 17. It was a dream come true and a new trajectory for my life. By this time I'd joined my first running club and quickly the running community became something of a second family to me. I look back on those unhealthy years and I can't believe it. At age 25, I was having trouble getting out of my car due to lower-back pain. I wore size 38 pants and a size 46 suit (now size 33 pants and a 40/42 suit). I used to have to wear wide-width shoes. Now I wear regular-width shoes (when you're overweight your feet swell). I really believe that episode of Oprah was the tipping point for us. As soon as we made the changes, the weight came off. When we made more changes, more weight came off. Today, if I pick up two 25-pound dumbbells, it hits me that I was carrying all of that and more at one time in my life. It's no wonder my lower back hurt so badly. I think I sometimes get really caught up in the next race and my training and let my ego rule my attitude. It's said you should never forget where you came from. I think I often forget what this blog is really about. I started it in 2007 as a guy who had just run his first 100-miler and was so full of love for this sport and the way of life that I wanted to share it with others. Why am I saying all of this? Yesterday I got another e-mail from an inspired reader looking for a healthier life and a better way. Then I looked through some of this site's "followers" and discovered some incredible stories on their own blogs. Following me are not only fellow ultra runners, but also people who are fighting their weight, making breakthroughs in their personal health, enduring setbacks and wresting with temptation. They're fighting the good fight every day. I know many runners who at one time battled a weight problem or smoked or even faced a frightening diagnosis. One day, for whatever reason, they'd had enough, found an old pair of athletic shoes in their garage and gone for a little run. The rest is history. Many runners have that story to tell. If you're reading this and unhappy about your health and want to do something about, check your garage or the back of your closet for that old pair of running shoes. Give 'em a go! Training Week 7/11-7/17 / Loving Muscle Milk! This was only a decent week of training. For the week, I got to 80.5 miles and 11 hours, 17 minutes of running. I would have liked to get to 90 miles and about 13-14 hours but we had plans over the weekend that cut a bit into my available time. Fairly good tempo run on Tuesday morning. 9.85 miles total; 5.5 miles at tempo pace (about 6:27 pace). New PR at Mount Falcon on Friday evening. I got to Walker's Dream 2.5 minutes faster than my previous PR, and I didn't walk a single step. You're looking at 1800 feet of vertical and rocky trail from the parking lot to Walker's Dream--not an easy climb. This was the second time in a row running to Walker's Dream without walking a step. Progress! Not-so-great 14.25-mile run at Deer Creek Canyon on Saturday morning. The heat was a bit much and my heart just wasn't into this run. Why? Anne was gone on Saturday morning and I got a babysitter for Noah. I couldn't help but feel guilty leaving Noah with a babysitter while I went on a training run. So I cut the run short and went home to be with my little boy. It was the right thing to do. The 2011 odometer is gonna hit 2,000 miles this week! When you look at the numbers, my mileage during this Leadville 100 cycle is a bit down from previous 100-mile training cycles. For one thing, I've yet to log a 100-mile week this year. I've had at least one seven-day stretch with 100 miles but, technically speaking, no 100-mile weeks. I'm not sure what to conclude from this reduction in mileage--I guess we'll see what comes of it on August 20! I do think it's possible I've gone into most of my 100s over-trained. I've talked to a lot of folks who have done quite well at the Leadville 100 running less mileage than I do. I'm willing to make this Leadville 100 an experiment to see if a little less mileage and more quality in the mountains equal better performance. My hunch is that quality (read: lots of training on the trails and in the mountains) is the central component of a successful Leadville 100 training program. My goal this week is to try to get to 15 hours (about 100 miles) if time allows. For me, the challenge of running upwards of 15 hours in a week isn't really physical; it's about time! Family responsibilities and my job keep me quite busy and it's hard finding 15 hours to train. But it's possible! And so this week I'll be gunning for maximum mileage and some nice quality in the mountains. I've also begun push-ups to strengthen my arms. I haven't done much upper-body conditioning in the last few months. I may also try to fit in a bike ride of two. Right now my emphasis is on hours, not mile. That's not easy for a native East Coaster to say. Back East, it's all about miles! I've recently become a fan of Muscle Milk. I'd never tried it until the Leadville Marathon a few weeks ago. The folks at CytoSport were at the finish providing free product. Well, I tried the banana creme flavor and loved it! It's freaking delicious and full of protein for a good, healthy recovery. My main recovery beverage continues to be Hammer Recoverite, but it's nice to break up the monotony now and then with a little Muscle Milk. If anyone from Muscle Milk is reading this endorsement, I'm glad to become one of your sponsored athletes! If you haven't yet tried Muscle Milk, get yourself some now! 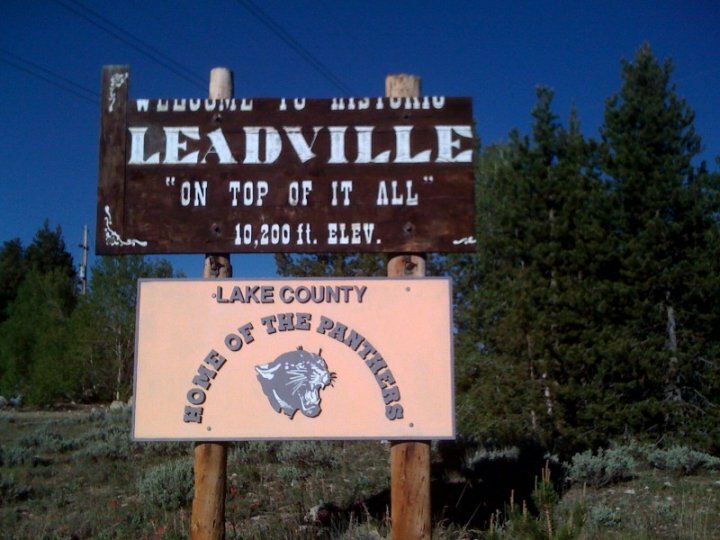 Do You Have Leadville 100 Jitters? I can't help but notice from my analytics that a lot of people are coming to this blog for Leadville 100 information. This time last year I was nervous as could be about the Leadville 100. So nervous that I trained to the point of breakdown and showed up on race morning with a destroyed foot. This year, my outlook is totally different. I've put way more emphasis on trail and mountain running, run more for time than mileage (I'm getting in about 80-95 miles/11-15 hours a week) and incorporated a variety of practices (e.g., running as much on soft surfaces) to keep my 38-year-old body feeling as fresh as possible. Yoga stretches are now part of my training and I've gotten to the point that my ankles and calves are dramatically more flexible than last year. I also have new muscles in my shins! But most important of all, I'm at peace with my training and know what to expect from "The Race Across the Sky." If there's one bit of advice I could give, it's to stay calm and loose now and through race day. The next bit of advice I'd give is to start tapering no later than July 31. You can ruin your race by over-training in the 3-4 weeks leading to the big event. Your longest run should be no later than this coming weekend. Late July and certainly August before the race are not the times for super long training runs. If you're new to Leadville and nervous about what's coming, I've posted a bunch of tips and information here. Stay loose and relaxed...and get 'er done! I'm hard at work planning for my nutritional needs at the Leadville Trail 100. Going into last year's race, my nutritional plan was really no different than what I'd done in previous 100s--"real food," along with bananas, gels, sports drink, soup and, of course, Coke. When I won the Mohican 100 in 2009, bananas, gels, Ramen and caffeinated beverages such as Red Bull and Coke were my fuel for the last 60 miles and I got through without any stomach ailments. It was the same at the USA 24-Hour National Championship in 2009. But those were sea level events. At the time, we lived in Ohio. When I lined up for the Leadville 100 last August, we'd lived in Colorado for only four months. And while I knew high-altitude racing was super hard, never did I realize that eating at 10,000+ feet could be, well, challenging, to say the least. Last year, basically nothing looked good at the aid stations except a few oranges here and there and maybe some soup. By the time I got to the Mayqueen tent at mile 86.5, I was pale, nauseous and on the verge of vomiting, which I did. This, in turn, degenerated into serious chills and about 45 minutes in a cot with blankets wrapped around me from head to toe and medical personnel checking my vitals. I was in bad shape. Finally, after eating a little, my strength returned and I was able to finish the race. The whole experience has forced me to carefully craft a nutrition plan for this year's Leadville that hopefully will fuel me from start to finish without any issues. You need to front load your nutrition and aim for ~75-100g of CHO per hour in the first 2-3 hours while your GI tract is still functioning. Once you start to really build fatigue then blood is shunted away from less important organs to most important organs like your brain, heart, lungs, kidneys. After ~3:00 you need to try and avoid fat for sure and also (I believe) protein particularly at high altitude where fat and protein require up to 20% more oxygen to metabolize. Gravitate towards liquids calories (not gels) with a mix of long chain (maltodextrin) and short chain (sucrose) glycogen. The maltodextrin and sucrose work very well together in a ~3:1 ration which promotes gastric emptying much better than anything out there. I used Carbo-Pro which is pure maltodextrin and mixed in powdered Gatorade. Or Ultra Fuel makes a pre mixed sports drink that works very well too. Fructose and sucrose are both good. In the next few days, I'm probably going to test Carbo-Pro. I like the sounds of this product since I can mix it with a sports drink such as Gatorade or even with water. I may also try Ultra Fuel. While I like Perpetuem, it does contain fat, which requires precious energy and oxygen to break down, so I'm hesitant to use it at Leadville. Later in the race, chicken broth and noodles will provide critical energy, too. If you have any ideas on nutrition for high-altitude racing, put them out there! On Monday, I went to Bluffs Regional Park in Highlands Ranch. I'd never been to the Bluffs, but it had been on my list for a while. The Bluffs doesn't have much elevation--just 6,300 feet--but does have some nice rolling hills and one pretty decent climb out of the parking lot if you head "left." The views of the city from a few spots are quite impressive. I covered 11 miles in about 1:30. It was hot! On Saturday, I got to Elk Meadow Open Space in Evergreen, where I ran to the top of 9,700-foot Bergen Peak. This was a 3-hour run. The starting elevation was about 7,900 feet and, for the day, I got in 2,600 feet of climbing. I felt pretty solid for the first hour and a half as I climbed the rocky switchbacks leading to the peak, but then started feeling downright awful on the descent and as I made my way through the meadow and back to my car. The culprit was obvious--I was very tired. Earlier in the week we'd had some problems with Noah sleeping and now it had caught up with me. I've come to realize that being tired temporarily lowers your VO2 max. On Sunday, after getting a good night's sleep, I headed to Deer Creek Canyon for a 3-hour run. Deer Creek Canyon is one of my favorite places to run. It doesn't bring much elevation (about 7,400 feet), but it does bring some nice, long climbs, beautiful single-track trails along ridges, and a few technical switch-backs, too. It's a great training ground for just about any mountain race. Throughout my run I felt fantastic, mentally and physically. I nailed the climbs pretty well and was running strong on the flats and downs. This run was a total 180 from the previous day's outing at Elk Meadow Open Space. All other days (Tuesday, Wednesday, Thursday and Friday) I ran in the Parker hills. Not much to tell, really. I am now averaging 70 miles per week. Usually I hit 2,000 miles by the third week in June, but not this year. The slow start due to my foot injury might mean I hit only about 3,600 miles this year. Dumb goals like how many miles are run in a year are just that--dumb. I used to put a lot of stock in getting to 4,000 in the year, but what does it really mean? Nothing! What matters are your race results and health! My goal for this week is 80-85 miles and about 11-12 hours. We have some major plans this coming weekend that might cut into my running a bit. I want to nail some nice quality this week and am planning two mountain outings. The following week (7/18-7/24), my mileage/time output will likely spike and then the week after that (7/25-7/31)--which would be four weeks before the 100--I'll gradually cut back. The taper will begin in earnest three weeks out. Sometime this month I have got to get to Leadville for a timed Hope Pass double-crossing. With the Leadville 100 now 6 weeks away, I feel really good about the current state of my training and fitness. But, most of all, I feel great about my attitude and outlook. I feel no pressure and am looking forward to the "fun" of Leadville. Success in 100s has a lot to do with your training, but it has even more to do with your mindset--both of which go hand-in-hand. When we moved to Colorado, I got sidetracked and started focusing too much on mileage and not enough on what goes into a successful 100-mile race, especially one in the mountains--confidence and lots of quality trail running that builds mental toughness. I came to put too much pressure on myself. I've developed a level of confidence and--dare I say?--inner peace that will allow me to go to Leadville feeling good about how I've trained and what I've done to prepare. That wasn't the case last year even as I'd put in tons of miles. This year, my miles are down slightly, but the quality is way up. I feel healthy and sharp right now and am ready to have some fun at the "Race Across the Sky." On Friday and Saturday, I watched the Hardrock 100 webcast with great interest. Results are posted here. Frenchman Julien Chorier crossed first with a time of 25:17. I'm pretty sure nasty snowpack lingering from the ferocious winter of 2010-2011 was a big factor at this year's Hardrock. The race brings 69,000 feet of total elevation change with an average elevation of 11,000 feet. My friend, that is downright crazy. No other race can compare with that--not Western States or Leadville. Only Wasatch comes close. You're running in the mighty San Juan Mountains in southern Colorado. There couldn't be a more glorious (or ridiculously challenging) place to hold the toughest mountain race in the world. With Europeans capturing this year's Western States and Hardrock titles, one has to wonder if an invasion is under way. 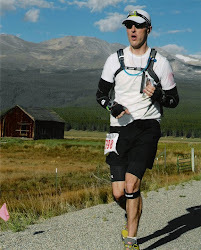 A lot has happened since I posted this race report after last year's Leadville Trail Marathon. In the past year, I've fought and (hopefully) overcome a devastating foot injury. My confidence has been shattered as my results have gotten worse and worse. At one point, right after the Jemez Mountain 50-Mile in May, my attitude was so bad that I threw around the idea of giving up on ultramarathoning altogether...and just becoming a fitness runner. Well, I believe I experienced something of a personal breakthrough, finishing 13th overall with a 4:39:29 out of 350 finishers (results here). For me, this is a personal breakthrough on at least two levels. First, on numbers alone, my 2011 LT Marathon time was far better than last year's result (13th this year, 28th last year; 4:39 this year, 4:55 last year). All along, I've just wanted to see improvement and got that on Saturday. Second, I just felt better physically and mentally. Going up 13,185-foot Mosquito Pass, I felt confident. I got to the top of Mosquito, which is the half-way point, 10 minutes faster (2:24 first-half split) than last year. Last year, this climb was a death march for me. Then on the long, rocky, treacherous descent down Mosquito, my personal anthem (WARNING: EXPLICIT LYRICS!) came on, and I started feeling really in the moment. I was very pleased with how I descended Mosquito. My mood was positive and I felt into this race. Still, I knew I'd probably experience a tough stretch somewhere, and it turns out my bad patch would be around miles 21-22, which are around 12,000 feet and come after a series of nasty climbs. I was suffering from the heat (it was around 70 degrees and super-sunny by then) and really feeling the elevation. This entire race is between 10,200 feet and 13,185 feet, so you're really up there. At around mile 21.5, a guy passed me as I struggled with dizziness, faintness and mild dehydration. The last aid station was just up the hill, so I wasn't too worried. Once there, I rehydrated with water and Coke and then started the long descent into town on a trail that could be described as quite rocky. My legs weren't too responsive on the descent, but they were nonetheless moving. Another guy passed me here! I wasn't too hard on myself as I got passed again because I knew this was still going to be a Leadville Marathon PR by at least 10 minutes, and I also knew the elevation had gotten to me a bit. I'll admit, too, that I might have gone out a bit fast, as well, and was now paying for it (but not too badly). Plus, just six days earlier I'd wrapped up a 95-mile week, so it's not like I was super fresh here. 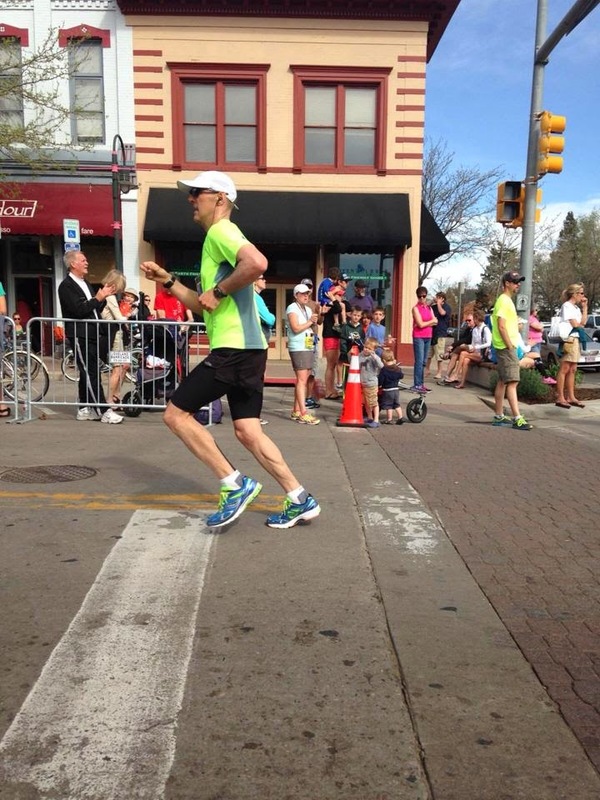 By the time I hit 6th Street with the finish in sight, I was running 7:00 pace and feeling pretty good. I was closing the gap between me and the three guys in front of me. I think if we had a few more miles in this race, I might have been able to close the gap entirely. I felt very positive when I crossed in 4:39, besting my time last year by 16 minutes. I didn't know my exact standing, but I figured I was top 15. I'm really pleased with my Leadville Marathon result. This is a race for fast guys and gals and, for me, coming off a 95-mile week and a very light taper, to have finished 13th feels very good. I'm a guy training for 100 miles in the mountains--steady and strong. I'm not training for a fast 26.2 miles in the mountains, so to have cracked the top 15 at the LT Marathon is a confidence-booster. In the first 6 miles alone, you climb over 2,100 feet! Then you drop the same around in the last 6 miles! At Pikes, you climb the first half, gaining a whopping 7,000+ feet--very hard indeed! But at Pikes, once you're at the top (having suffered terribly the last 2,000 vertical feet), you can cruise back down with basically no ascents in your way. Not so at the Leadville Marathon! The Leadville course beats the tar out of you both ways! At Pikes, the base elevation is just shy of 7,000 feet and the max is 14,115 feet. At Leadville, you're running between 10,200-13,185 the whole time. I'd be interested to hear what some Pikes veterans think. Maybe I'm dead-wrong on this assertion. With the Leadville 100 now 7 weeks away, and four more big weeks of training before taper time, I think it's critical that I try to set things up so I'm peaking on race-day. I'm definitely in better shape now than I was a month ago. The emphasis I'm placing on getting to the mountains and trails 2-3 times a week is paying off. I feel stronger on the climbs and am progressively feeling more confident on the descents. The plan this week is not to force myself back into high mileage after the marathon and just see what I can do. If I can get in 90 miles, great. If my body needs rest, that's OK, too. I'm just going to let it all come to me. The only thing I can say for certain is that I'm planning to get to the mountains/trails three times this week. I sure wish I could go down to Hardrock this weekend to pace someone, but family commitments won't allow it. Definitely next year!